The disparate and fragmented histories of Black men and women in Germany long created a barrier to the recognition of the commonalities among Black Germans as subjects of their own history and historiography. Beginning in the early 1980s Black Germans have not only begun to form a new Black German cultural movement but also to rewrite German history from a Black perspective. 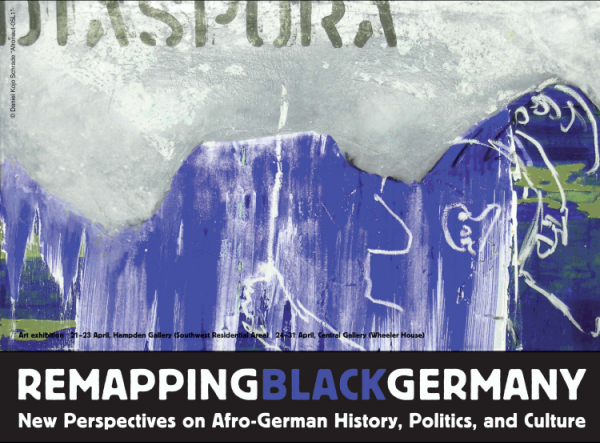 Since its inauguration, the project of recovering the Black presence in Germany has given rise to an array of methodological approaches that draw inspiration from African-American Studies, feminism, literary theory, anthropology, and cultural studies. This conference explores new directions in Black German Studies. Conceived in an interdisciplinary and transnational way, Black German Studies can not only contribute to Black diaspora and German Studies but also illuminate the process of modern racial formation from new perspectives. A series of cultural events, including musical performances, spoken word poetry, and art exhibitions will be held in conjunction with the conference. All events are free and open to the public, but we appreciate your registration and ask that you pay for your meals by April 15th.